Terms: Good Credit Card required to register. 5.5% sales tax. 18% buyer's fee. W Yoder Auction, LLC not responsible for lost, stollen or damaged items. All sales final with NO REFUNDS OR WARRANTIES! You are responsible for the payment of your items. All items must be picked up by Friday, November 23, 2018. 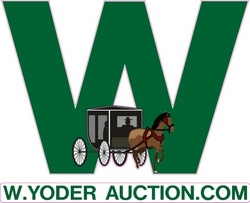 Anything left after said day will become property of W. Yoder Auction and you will NOT receive a refund!When registering as a new bidder, the credit card you register with will have a $1.00 authorization done. The credit card used for registration will be charged following the auction unless you specifically reply to the unpaid invoice to arrange for a different payment method. Please do NOT call us to set up alternative payment method, if you do, it will be disregarded, and your credit card will still be charged. If alternative payment is approved, we accept cash, good check or a separate credit card (+3% if you use an alternate credit card). Our auctions feature an auto bid extend (soft close). This means that if somebody bids close to the end, it will extend the bid time on that lot. An 18% buyers' fee is in effect, plus applicable sales tax. Your credit card will be charged first thing Tuesday morning following the auction. If you plan to pick up your items, you may pay by cash or check, but the 18% buyers' fee remains in effect, and you will have 3 business days to do so following the auction. If no payment is made after the 3rd day, we will charge your credit card.W. Yoder Auction, LLC does not test items for genuineness. All descriptions are believed true; however, inspections are encouraged. Any items left behind after the pickup date or dates will be considered abandoned and will be forfeited and returned to inventory unless alternate pickup or shipping arrangements were made prior to said deadline. If this is an out of auction house sale and you wish us to bring your items back to our location, please email or call us. Please note this is not a free service.oAll items sold 'AS IS, WHERE IS" with all faults. All sales are final;oNo implied or express warranties by auction company.oAll descriptions are believed accurate but are not guaranteed or warranted.oPictures are part of the description - so we encourage you to look at them all oBidder inspection is encouraged.oBy placing a bid, bidder signifies that they have examined the items to their satisfaction, or that they have chosen not to personally examine them.oApplicable taxes of 5.5% sales tax will be charged unless a sales tax exemption form is provided.oBuyer's premium of 18% will be charged.oAny disagreement between auction company and buyer will remain the jurisdiction of Waushara County Circuit Court, Wautoma, Wisconsin. ***If you see a lot marked as "age unknown," that means we do not know how old it is, but in our opinion it may not be old. *** "Authentic/Original" means we believe it to be all original. Everything marked "authentic/original" will be guaranteed. *** "Not Old" means our opinion is the item is not very old*** "Fantasy Art / Yard Art / Garage Art" means an original was never made and this is a newer item.